Howdy. My name is Michael Robinson. While J.D. is visiting Europe with his cousins, I volunteered to share how my wife and I have leveraged the power of geographic arbitrage to pursue our dreams — and to build our wealth. Geographic arbitrage means taking advantage of the differences in prices between various locations. You earn money in a stronger economy (San Francisco, maybe, or the U.S. in general) and spend it in a weaker economy (South Dakota or Ecuador, for instance). Geographic arbitrage is a powerful tactic worth considering if you want to increase your saving rate so that you can better pursue your financial goals. Several times over the course of our lives together so far, my wife and I have managed to unwittingly stumble upon the benefits of geographic arbitrage. If you’ve ever chosen your vacation destination based on how strong the country’s currency is — opting to visit England when the pound was weak, maybe — then you’ve practiced geographic arbitrage. Today, I’m going to share three examples of how the concept has impacted our lives and helped us to achieve financial independence at 33. I hope these examples will spark some ideas for how you might be able to leverage geographic arbitrage along your financial journey as well. 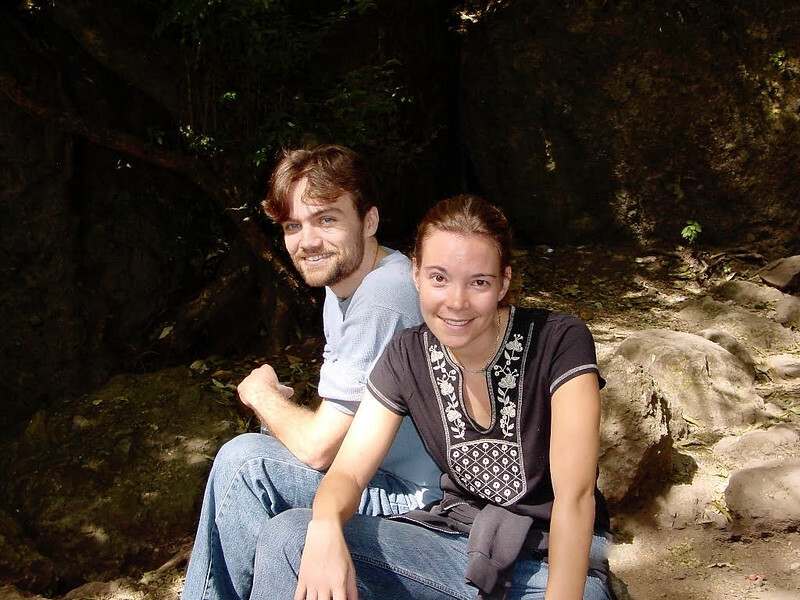 I met my wife Ellen in Cuernavaca, Mexico in 2004. We were both studying Spanish at the same language school. I was there to earn the last few credits I needed to complete a minor in Spanish. Ellen hoped the months of Spanish immersion would help her land a job as a bilingual elementary teacher in the Pacific Northwest. Despite Ellen’s intention to avoid befriending any native English-speaking gringos like me, we hit it off right away and quickly became close friends. As our months together in Mexico wound down, Ellen’s efforts paid off and she was hired by a bilingual elementary school in Shelton, Washington. I graduated and was offered a position as an international sales manager. Ellen and I started a long-distance relationship that summer and I moved out to Washington to join her as soon as I could. Our first experience with geographic arbitrage was unintentional. We didn’t even realize what we were doing at the time. After Ellen’s first two years as a bilingual teacher, she asked her principal for a one-year leave of absence so she could return to Mexico and further improve her Spanish proficiency. Her principal agreed and we packed up and headed to Guadalajara for the 2007-2008 school year. Although we lost Ellen’s annual $30,000 salary, we didn’t feel it much because our cost of living was considerably lower during that year in Mexico. Our apartments in Washington had each cost us $800-$900 per month. In Mexico, we were able to find a suitable apartment to share for around $400 per month. Groceries and other goods and services were all also considerably cheaper. Geographic arbitrage allowed us to maintain our standard of living in Mexico despite the loss of one income. During all of our highest-earning years, Ellen and I happened to live in Nevada, Washington, and Texas — all locations without state income tax. While avoiding state income tax is obviously appealing, these states make up for that lost revenue by increasing taxes in other areas. Nevada: There is no personal or corporate income tax because the state collects billions of dollars each year in the form of gambling taxes and fees. While we lived there, I gambled with exactly $0 of my money, avoiding this tax altogether. Washington: Here we had one of the highest sales tax rates in the country (8.88%) and high gas prices on account of higher gasoline taxes. While we lived there, we didn’t consume a lot compared to most households, which lowered our sales tax burden. I also worked from a home office and Ellen taught at a nearby school so we didn’t really use inordinate amounts of gasoline either. Texas: Here we also had a high sales tax rate (8.25%) and lived in the state with the fourth-highest property tax rate in the country — incredibly, we owed over 2% of our home’s value every year in property taxes! In Texas, we maintained our relatively frugal lifestyle, again reducing our exposure to the higher sales tax burden. And although we were pre-approved for an inexplicably high $750,000 mortgage in 2007 (on our two five-figure incomes no less! ), we chose to instead take on a $100,000 mortgage and buy a starter home less than a mile from the office where we knew I’d be working. We moved to Colorado in 2016, the same year we both stopped working full-time. This is the first state we’ve lived in together where we’ve been charged state income tax (a middling 4.63%, the 23rd-lowest in the country). But we have low property taxes and the lowest state sales tax in the country (out of states collecting sales tax). Although we’re now paying state income tax in Colorado, our earned income as early retirees is predictably the lowest it’s been in our fourteen-year relationship. And although we’ve bought a home that cost us almost three times as much as what we paid for our Texas home, we’re actually paying less each year in property taxes. Bonus fact for money nerds! For anyone curious, here’s the complete list of states with no state income tax: Alaska, Florida, Nevada, New Hampshire, South Dakota, Tennessee, Texas, Washington, and Wyoming. Note, however, that while New Hampshire currently charges no state income tax on earned income, it does tax investment income. Also, Tennessee currently charges no state income tax on earned income, but does tax some dividends and interest income. However, Tennessee has announced plans to phase out state income taxes altogether by 2022. Our most recent experience with geographic arbitrage was more deliberate. When we learned that 31 October 2016 was going to be my last day of full-time work, it didn’t take us long to devise a plan to return to Latin America, this time with our two young children. At the time, Cuenca, Ecuador was the only Latin American city in their database that had earned the designations “low crime” and “low pollution”. Since we were traveling there with a nine-month-old and a two-year-old, those seemed like great characteristics to us! We did some additional research on similar tools and local expat forums, and only became more and more interested in visiting the city. Here’s a short promo video showcasing Cuenca and the surrounding Andean mountain region. Shortly after we decided to spend our first winter in Cuenca, I had another ambitious idea. I felt it would be wasteful for our house to sit empty for three months while we were traveling, so I proposed to Ellen that we experiment with hosting our home on Airbnb while we were away. She was resistant at first, and rightly so. It was going to take a lot of work to get our home ready and sort out who would manage everything while we were away, among other things. But she came around to the idea and we gave it a go. 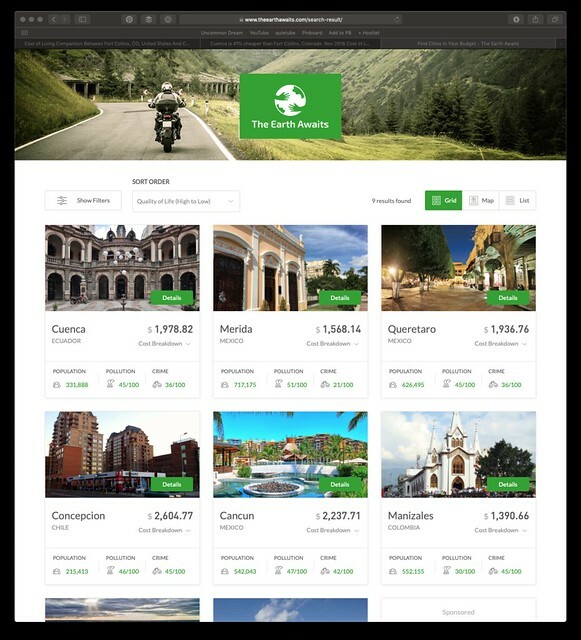 We’ve discussed our Airbnb hosting experience in more detail in the following articles at our website, and we’ve done a fair amount of Airbnb hosting since. We were very impressed with the success of our Airbnb experiment. Our home’s first ever booking was $1,890 for 8 nights! 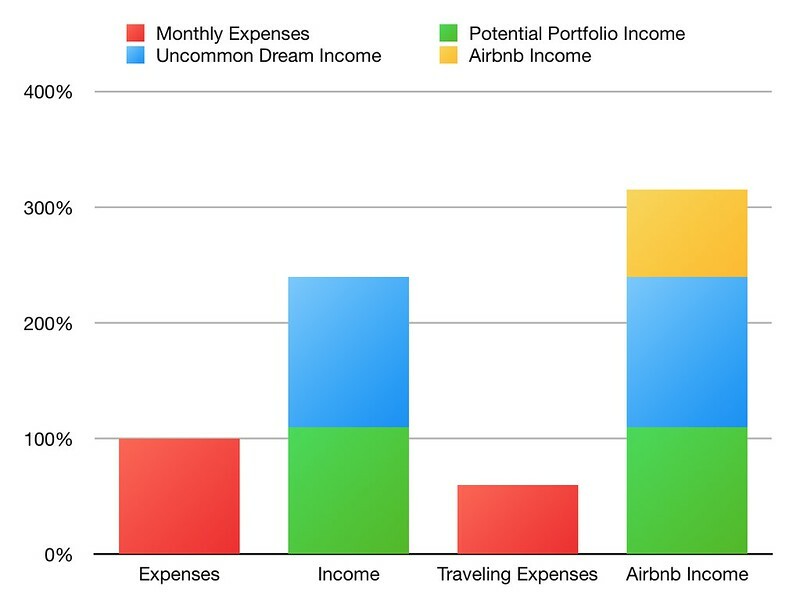 While we choose not to publish our net worth and our monthly expenses in dollars for personal reasons, I’ve prepared the following chart to illustrate the impact Airbnb had on our financial picture while we were traveling. Expenses: Our standard monthly expenses are represented on the chart as 100%. We’ve been tracking our expenses in Mint since 2008 and Personal Capital since 2013. Before that, I tracked another decade of our expenses in desktop budgeting software. So we feel pretty confident in our understanding and control of our monthly expenses. Traveling Expenses: This shows approximately how much our monthly expenses dropped during our 6 months (two winters) in Cuenca. Potential Portfolio Income: This shows our safe monthly spending level should we live solely off of our investment portfolio per the 4% rule. Uncommon Dream Income: Although neither of us work full-time, I enjoy doing a day or two each week of consulting and we earn a small amount of income from our blog. Rental Income: This represents the monthly income we’ve been able to earn through Airbnb while we’re traveling. In case you missed it, let me draw your attention to an important point: Our monthly expenses while we were living in Cuenca were actually lower than our monthly Airbnb income. So, if we hadn’t spent over a decade accumulating a portfolio of assets that could cover our living expenses, and if we weren’t continuing to earn any income, our Airbnb rental income alone still could have covered our cost of living abroad! This actually exceeded my own expectations for our Airbnb experiment. I also need to point out that we prioritized paying off our first home during the 2008-2009 recession. And we haven’t carried a mortgage since. The potential is certainly magnified by the absence of a mortgage. But even homeowners with a mortgage or renters may very well be able to cover their housing related bills this way, freeing them up to more affordably slow travel. If you’re interested in becoming an Airbnb host, you can sign up with this link. When I ask people what they would do if money weren’t a factor, traveling abroad often makes the list. While travel is a common desire, everyone’s specific motivations vary. Some dream of learning another language while others are drawn to an area’s unique geographical features. Still others seek to experience life in a radically different culture. For most of us though, money is a factor. But that’s no reason to give up on the dream of traveling abroad. Living costs around the world vary tremendously and many great destinations are quite affordable. We’ve met a number of people living abroad who fund their overseas lifestyles in creative ways. Some live on personal savings while others rely on income from rental properties back home. Some work remotely while others find local work. A few of our expat friends have even started companies abroad. If travel is a priority for you, don’t let your current financial situation act as a barrier. Get creative. Use tools like The Earth Awaits to discover affordable places to live. Leverage the power of geographic arbitrage to pursue your dreams! Michael and his wife Ellen achieved financial independence at 33 and retired early at 36. Now they’re raising two kids in Colorado (and abroad) while writing about money, life, and their family’s adventures at Uncommon Dream. Ask the Readers: How Do You Stay On Budget During the Holidays?